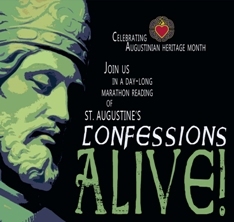 Join the Confessions Alive! marathon reading of St. Augustine’s well-known work, hosted by Falvey Memorial Library, in partnership with the Villanova University Classical Studies Program, the Office for Mission and Ministry, and the Villanova Center for Liberal Education. The day-long public reading will begin at 9 a.m. on Wednesday, Nov. 3, 2010, in Falvey Memorial Library’s first floor lounge. University President Rev. Peter Donohue, O.S.A., will commence the reading at 9 a.m. It will continue until midnight, with refreshments available to participants throughout the day. Students and members of the University community may participate by reading a portion of the text aloud or just stopping in to listen. Additionally, a slide show of images and a reading guide created by the Classical Studies Program will be made available to assist participants in contextualizing the reading. The event is free and open to the public and is part of Villanova’s celebration of Augustinian Heritage Month. It is approved for Augustine and Culture Seminar (ACS) co-curricular event credit. Confessions Alive! marks the third year in a proposed four-year cycle of community readings of classical texts. Previous years featured readings of the Odyssey and the Iliad.